Multiplication facts can be very frustrating. Whether your child is working on their Hartnell facts or their Smith facts it can be bothersome. 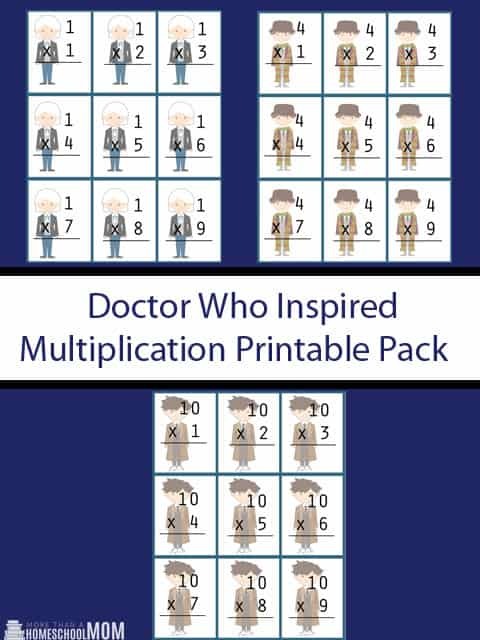 I have put together a great Doctor Who Multiplication Printable pack to help your child not only learn their facts but have fun doing it! I highly recommend cutting them out and laminating them so that you can use them over and over. Does Netflix Have Doctor Who? Over the last few years Doctor Who fans have had to try a little harder to get their fix. Netflix streaming lost the rights to Doctor Who and they were given to Amazon Prime. Many loyal Netflix fans were disappointed to see Doctor Who leave their favorite platform and refused to pay for Prime. While I am a huge fan of Amazon Prime, I understand why they were upset! That said, I have some really great news for you. Netflix has Doctor Who! Christmas is just around the corner. If you are thinking about gifting someone something from my Whovian Gift list you might want an equally amazing way to give it to them! When I was making the Harry Potter tote for R and the Pirate tote for C I had to have something with a bit more of a Whovian flare while still honoring my Disney side! That’s why I put together this DIY Doctor Who Mickey Tote!